The verein Deutsch-Drahthaar (VDD), www.drahthaar.de, is an organization in Germany devoted to the single purpose of breeding the Deutsch Drahthaar (DD). For a better understanding of the breed and the organization, visit Group North America web site www.vdd-gna.org. This link will provide you with the historical background of the DD, the ideals, breeding regulations, and organizational structure of the VDD. vom Elderbach was registered as a verein Deutsch-Drahthaar kennel in 1993. All Deutsch-Drahthaars bought, sold and otherwise associated with this kennel are registered with the Federation Cynologique International (FCI), www.fci.be; Verband Deutsche Hundwesen (VDH), www.vdh.de and are certified for breeding according to the rules and regulations of the VDD. 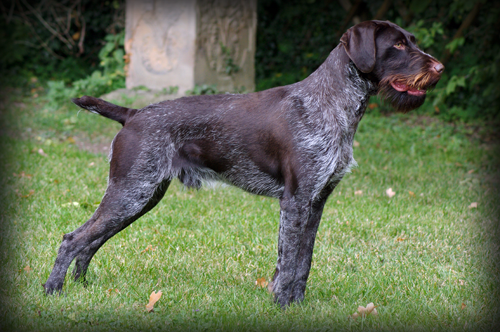 vom Elderbach kennel has no association with the separate and distinct German Wirehair Pointer breed that is registered with the American Kennel Club (AKC) or any association with the Kennel Club organizations or various other organizations such as North American Versatile Hunting Dog Association (NAVDHA). Deutsch-Drahthaars associated with vom Elderbach kennel are performance tested in officially sanctioned Jagdgebrauchshund (JGHV), www.jghv.de tests.